Today I look back and realize I have been running for the past 5 years. What started out as 'running to lose weight' has propelled into a love and passion not just for running but for multisport. Although I started running ahead of my husband, he was the first to buy a bike (so he could start doing duathlons) and then eventually enrolled in swim classes (to do triathlon). Eventually, I got myself a bike and yes, enrolled in swim class too. But running always had (and still has) that number 1 place in my heart. When I started running, I had no legit running shoes. I would shuffle between my old Nike shox and my Nike Presto. Eventually, my Prestos gave way while my legs gave way to my shox. Since I was already practically running everyday, I knew I had to look for a good pair of running shoes. As a newbie, my first consideration was always still the aesthetic value of the shoe. I wanted one that looked very attractive. So yes, I ended up investing in the wrong shoes - pretty and cute but gave my calf muscles the worse sore feeling. Then someone told me the best would be to get a stability running shoe. So I did. It provided me with the right support but boy were they heavy! So anyway, as the running years passed I came to realize that we all have our unique needs when it comes to choosing the right pair of running shoes. Setting aside the attractiveness of the shoe, I went for one that did not look that attractive but did seem to provide me with the perfect fit and comfort. 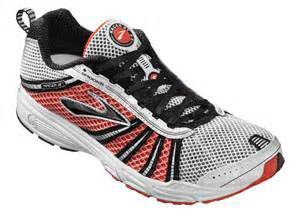 The Brooks st5 did not immediately appeal to me -- it looked like an old school running shoe to me! But once I started to use it, there was no more stopping me. It was light but provided me with the proper foot support and its mesh material provided my feet with enough air to keep them from getting too hot. After running numerous half marys and a marathon with my st5, I ended up buying 2 more pairs thereafter- of the same color. I used them on long runs, short runs, during training, when I did my 1st duathlon and even during my 1st triathlon. It is important to choose the right running shoe for you. Sticking to something that looks great but provides so much discomfort and eventually lead to dangerous consequences or injuries that can affect you long term. Again, not one shoe fits all. Sometimes it really is a trial and error journey. Most sports or running stores provide gait analysis to their customers which could assist and help you choose the right shoe for you.